The first round of Contract for Difference (CFD) allocation by Department of Energy and Climate Change (DECC) to various power generating projects has just been announced in the UK. Round One sees 27 contracts worth £315 million allocated to deliver renewable energy across the country including new facilities for waste, wind and solar farms. Among the chosen few, BH EnergyGap’s 3Rs facility in Walsall was one of just three advanced conversion technology plants that were successful. Award of the contract will now allow financial close to be completed and construction to commence. The 3Rs facility is designed to take industrial and commercial waste from the surrounding area. It will have an extensive materials extraction facility to recover recyclables and utilise energy recovery for the remaining waste. This advanced thermal treatment technology, known as Gasification, will produce a gas from the prepared feedstock, which fires a boiler to produce electricity. It does not burn the waste itself. The facility therefore meets the best practice of modern waste management. 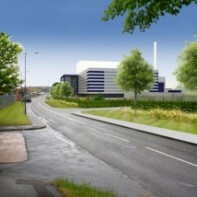 Artist’s impression of the facility to be built on Fryers Road, Walsall.